Every fence needs a gate to provide access to the enclosed area. It can be custom-designed to match the style of your fence or as a focal point to the yard's landscape. The fence can be a simple chain-link just to keep the dogs in the yard. A double gate is not difficult to build and the do-it-yourself handyman can create a custom double gate in a few days. 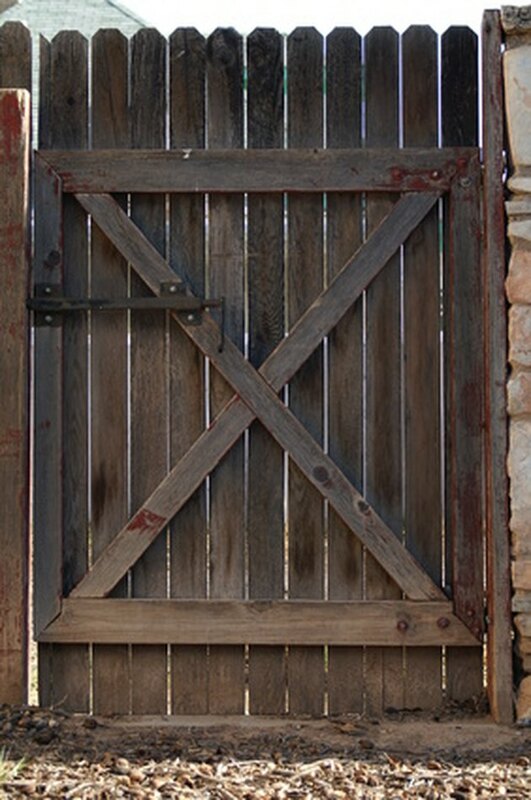 Wood gates can be protective or decorative. Measure the distance between the two posts for the double gate, using a tape measure. Check the width at the top, middle, and bottom. Use the smallest of the three dimensions. Subtract 3 inches from the width of the gate post and divided that by two for the width of each gate. Cut four 2-by-4s to to the width you just determined and 12 inches less than the height of the gate, using a miter saw. These will make the top and bottom of the gate frames. Assemble the gate, using construction adhesive and 3-inch exterior deck screws. Apply the construction adhesive to the top and bottom ends of the vertical gate frame. Set the top and bottom gate pieces on the vertical pieces and screw them together to form a large rectangle, using a power screwdriver. Use a large square to check the corners. Place a 2-by-4 diagonally across the frame from the bottom right up to the top left. Use a pencil to mark the board to fit within the frame. Cut the board, using a miter saw. Apply construction adhesive to the ends you just cut and place within the frame. Screw them within the frame, using the 3-inch exterior deck screws. Apply a layer of construction adhesive to the face of the gate frame and place fence pickets over the frame to match the existing fence. Screw these to the frame, using 2-inch exterior deck screws and a power screwdriver. Repeat steps 3 through 5 for the other side of the gate.